For the last couple of weeks, my home has been filled with family and friends. But there’s one person I hadn’t yet seen over the holidays — Little Biker Boy. This morning, I drove out to the town where he lives so we could spend some time together. Biker Boy is not little any more, although he still does love to ride a bicycle. He’s taller than me now, and in a dark hoodie and shorts (yes, shorts even in the winter! ), he looks like the teenager he is. But despite his height and facial hair, he is still the same affectionate, good-natured kid. After I picked him up, we ate pizza at a local pizza place, as is our tradition. Then we drove to the nearest park, a place with rock cliffs and a waterfall surging with snowmelt, to take a walk. It’s been almost two years since Biker Boy moved in with his adoptive parents, and it’s just incredible to see what a difference a loving, stable home can make. We talked about school and girls and snowmobiles and video games, and the whole conversation was wonderfully normal and low-key. All the anger that used to simmer below the surface has dissipated, leaving just all the good characteristics that were there all along. “I’m so much like your kids,” he said, dropping back to walk next to me, pretending to push me off the path. We're ready for Christmas. The tree is decorated. Family members have arrived, the younger ones bringing sleeping bags since we don't have enough beds for all. The refrigerator is so filled that I've resorted to stacking food on a table in our conveniently cold garage. We'll be using all four burners on the stove, plus several crockpots on the counter. I've carried in enough firewood to keep the fire going. Twenty-six family members will gather at my house for Christmas Eve, and most of us will be here again for Christmas dinner. Traditionally, we each buy only one gift. It was With-a-Why's turn to be Secret Santa this year. He declared himself the King of the North, and he matched up family members, sending us each an email telling us who to buy for. Great secrecy surrounds the Secret Santa gift exchange, and I haven't guessed yet who has me. 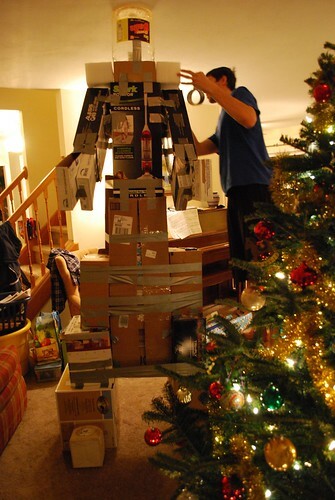 Most of us wrap our gifts quite simply, sometimes even just stapling together the store bag, but it's a tradition for Boy-in-Black to wrap his gift in the most ridiculous way possible, using every empty box piled in the garage and every bit of leftover wrapping paper. 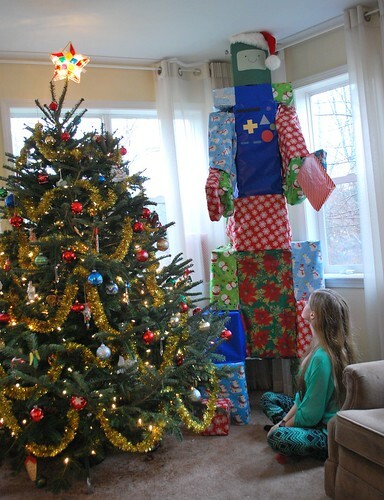 His project this year was an eight-foot robot that is taller than the Christmas tree. His name is GMO, and he's standing in the corner, ready to greet family members as they arrive.